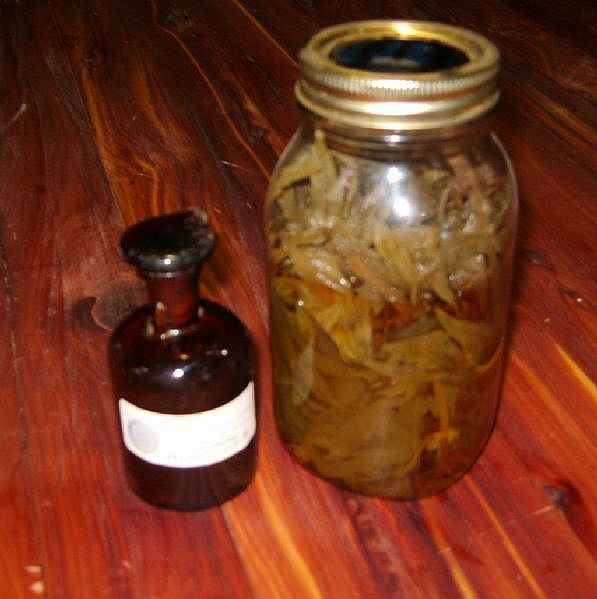 Tincture weed is way of consuming medical marijuana through alcohol extraction. Marijuana Tinctures are very concentrated, so a dose may be only a few drops or a teaspoon or two. For best results it is important to use pure alcohol like Everclear, which is 95%. Vodka is good, but when it says 40%, it means the rest is water. If you are wanting to use vodka, you should use THC induced Vodka which will add to the potency. In whole-plant cannabis, THC content is expressed as THCA (tetrahydrocannabolic acid) prior to decarboxilation into THC, which takes place when cannabis is heated during cooking, and smoked or vaporized ingestion. THCA is a mild analgesic and anti-inflammatory but does not have good affinity with our CB1 receptors, so in order to make a THC-rich tincture that has many of the same therapeutic effects as smoked ingestion (including rapid absorption, quick relief and ease of self-titration), we must convert the THCA in the plant matter into THC prior to extracting it through an alcohol soak. Clean 4 ounces of stem-free leaf or 10 grams of bud in 2 quarts of warm water. Stir the leaf and water so they are well-mixed and the leaf is wet. Keeping the leaves whole makes it easier to work with. Strain out the leaves with a strainer, letting the greenish water drain into a receptacle. This step will wash out much of the green chlorophyll. Place the wet leaf in a bowl and cover with 1 quart of 80+ proof alcohol of your choice. Stir the blend until the alcohol and leaf are well-mixed. Make sure all leaf is covered with alcohol. Put a lid on the bowl so the alcohol cannot evaporate, and let it sit for 48 hours. Take the lid off the bowl, and let the mix sit uncovered for 12 hours, until about half the alcohol evaporates. Stir the brew again so it is well-mixed, and pour it through a coffee filter into a receptacle. Use the coffee filter to wring out all liquid from the leaves. Pour the alcohol through the leaves again, and wring out the liquid. I have an evapor system that i use liquid re apple juice, i wonder if it could be added to the evapor barrrel??????????? Two things I noted: First, for decarboxilation prior to tincture, I grind and heat my bud on a cookie tray at 170 degrees for 10 minutes. Second, this washing method sounds somewhat faulty in that any crystals on the buds will be washed away with the water – not cool. I don’t have a solution for getting rid of the chlorophyll (was actually surfing the web for a solution when I came here). For now, I make some potent green dragon, but it does taste disgusting with all the chlorophyll still in it. I am a recovering Alcoholic so I would not want to use an Alcohol based Tincture. I believe I will look into using Glycerin as it is a non Alcoholic liquid and works well to making tinctures. I used to buy the tincture made from Glycerin from my collective in San Diego, California until it was closed down. I may try the one using Milk version also. Just got a good harvest in from 10 GDP so I have enough for my Tincture and also my Hemp Oil for my Leukemia. After the last step (Second wringing of coffee filter), have you ever just let the alcohol evaporate completely, thus leaving crystals? I’m just wondering if one “could” to that and just sprinkle them on food like sprinkling sugar? OR even let the alcohol evaporate until it gets kinda pasty like a real thick jam and apply it to food? everyone is effected differently.. i personally like tinctures, although they do take quite a bit of buds to make. in your case with only 5 buds, i would continue smoking. if you had a large amount i would recommend a tincture..
(something like one little puff in a small pipe) will last me a long time! The question here is how long a tincture will last vs. smoking to receive a similar effect. I have Everclear and five buds. Will I receive a product that will be cost efficient with a minimal loss of those five buds. I appreciate the type of effect is different in both ways and I would like to experience something different.